Stanbury Mouth is south of Morwenstow, north of Duckpool and west of Shop. The path to Stanbury Mouth is found at the end of a long lane that passes through Stanbury. The footpath skirts the edge of a field then down through a small valley that drops to the coast. There are breathtaking walks to be had here that lead both south past Lower Sharpnose point to Duckpool and north past Hippa Point and Upper Sharpnose point to Lucky Hole, Hawkers Hut and ultimately, Marsland Mouth on the border between Cornwall and England. The beach at Stanbury Mouth is approached on foot, and the nearest you can get in a car is about a half mile away. However the beach is well worth the walk down as it is excellent for surfing and sunbathing. Like Duckpool, the sandy areas of beach and more craggy outcroppings and pebbly areas are revealed as the tide recedes, where in rock pools and all manor of marine life can be found. The Vicarage built by Rev. Hawker and based on his beloved Oxford's spires is close by at Morwenstow. Hence "Vicarage Cliff" and "Hawkers Hut" which was constructed from driftwood by Reverend Hawker, whom used it to sit and shelter here whilst writing his poetry and staring out across the wild Atlantic. Also just to the north of Stanbury Mouth, a disused coastguard station can be found. 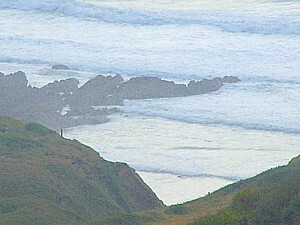 Seals can sometimes be seen playing in the surf along this stretch of coast. 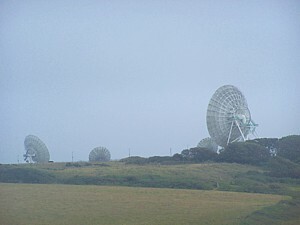 The headland here is dominated by the satellite station which you pass by on the way down to Stanbury Mouth. 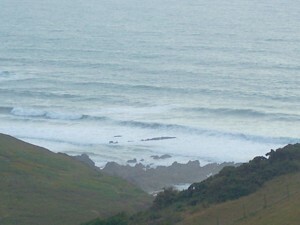 The beach boasts good surf and good marine life too but it is generally not recommended to swim here. Take Heed...There are no lifeguards at Stanbury Mouth. There are no amenities at Stanbury Mouth. Just a very small car park. Woodford is a short distance from here, as is Morwenstow and this neck of the woods offers the holiday maker all types of accommodation, from farmhouse and bed and breakfast accommodation to campsites and such.